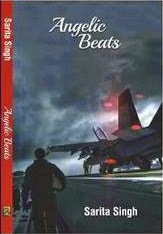 Dear readers, today on ILF we are delighted to have Sarita Singh author of ‘Angelic Beats’, part if the blog tour by The Book Club. ILF: It’s our pleasure talking to you Sarita, our first question is obviously related to the star attraction ‘Angelic Beats’. What was the inspiration and idea behind it? SS: I believe that every person on this universe has a calling. Sooner or later you recognize it. At the end of the day you know what you want to do in life just for yourself. Writing was my calling. Doing this makes me happy. Then searching an idea for angelic beats was not difficult as I wanted to write about love. But only as a guiding force of life. The story was thought retrospectively. The end was decided first. So I thought of keeping the protagonist as a NDA cadet. The restrictions there helped describe the feelings of separation and they acted as a guiding force for the lady Aakanksha to look for other progressive avenues in life. ILF: What were the challenges faced in writing Angelic Beats? SS: Well, writing about such a prestigious academy was not easy. I had to do a lot of homework. SS: Patience is needed to decide the publisher. The time between completion of draft and getting published is really crucial. Don’t underestimate or doubt your creativity. Good editing is really indispensible and it garnishes the work. SS: Writers are mirrors of society. They reflect society be it contemporary or of a particular period. The onus of being reflective of the society; truly and honestly, lies on the writer. If my writing can inspire anybody towards life that can be biggest achievement of being a writer. When people show that confidence in you and approach you with their personal problems expecting a miraculous solution, it is really demanding and a bit awkward. ILF: Upcoming writing projects in the works? If so, when can we expect the fantastic book. SS: Yeah I’m working on my next book. But no rush. I enjoy writing and do it as and when suitable to me and my family. SS: Regarding angelic beats only, people get surprised that being a female I wrote the book from a male’s perspective. And of course, writing about a defence academy where girls are not taken as cadets, too surprises them. SS: Patience always pays. Don’t get let down by rejections. Trust your work and creativity. Thank you Sarita for sharing your wonderful experiences and thoughts with us. All the best for your future endeavours. ings two opposite people, Sahil and Aakanksha, on one platform. Even their personal statuses do not match for one is married and the other single. One is confident about making choices in life, whereas the other is always scared of making a choice. One is always positive, and the other is negative in outlook. Unlike mathematics, where “+” and “−” always make “−”, sometimes in real life, “+” and “−“ do make a “+” together. On the road leading to his passion, he happened to meet the first love of his life too. Before going to the National Defence Academy for the journey to be a commissioned officer in Indian Air Force finally, he introduced “love” in her and his own life and pledged his heart to her. The arrows of cupid struck her also. Do their final choices engulf all other relationships like a storm and rage and bleed their self-esteem? Or are they able to carry their choices gracefully through their quest for happiness? The author, Sarita Singh, is a post-graduate in chemistry with a post-graduate diploma in mass communications. Born and brought up in Panipat, Haryana, she has been married to a doctor and is blessed with a son. The author is a state civil services (allied) officer, who has also taught in various institutions earlier. Reading and writing have always been a part of Sarita Singh. Like many others, she too loves gossiping and enjoying with friends and family as she loves spending time with them.